We are focused on providing you with the best results and service in the industry. We listen carefully to understand your real estate needs and work hard to create solutions that make sense to you. Whether you are new to the market or an experienced investor, we have the expertise, proven track record, and resources to help you achieve your real estate goals. 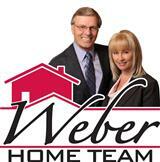 Weber Home Team consists of Dan & Janet Weber, Maleah Finucane, Brittani Evans, Michele Troutman, and Jenny McGuire. Dan & Janet specialize in listing and selling homes. When you are looking to buy or sell the largest investment in your lifetime - you are looking for Realtors with experience, knowledge and commitment to their clients. Dan and Janet take their career of sales, marketing and customer service very serious. They believe in teamwork, dedication and most of all - honesty! Both Dan and Janet have an extensive background in marketing. Dan knows the Real Estate market and is an exceptional negotiator. His ability to analyze, price and sell homes has been proven year after year. Janet stays on the cutting edge of technology. In this fast paced internet age it is vital to stay competitive and on top. Janet also provides a home staging service. This is a valuable tool that helps homes sell quickly and for top dollar! Dan and Janet's knowledge and professionalism has kept the Weber Home Team rated one of the top Realtor teams in Oklahoma. Maleah is a licensed Realtor and has several roles. Her years of experience have made her a great Lead Buyer Specialist handling training and tracking sales. When Maleah works with buyers her goal is to make sure they have all the facts needed to make a wise decision. She is also the team's Administrative Manager and Trainer. With a degree in human resource management Maleah is an excellent communicator. She is friendly, knowledgeable and buyers and sellers love her! Brittani is our Marketing Administrator and also has a Realtor license. Her expertise is in getting all the marketing out to the public. Brittani maintains our listings, our websites and social media. She also communicates with sellers regarding showing activity on their homes. After every showing Brittani will call to see what each has said about their home. This report goes out to the seller weekly! Brittani also helps with the closing coordinator position. She makes sure closings go smoothly and buyers and seller are informed from contract to close. She works out details so they don't become problems. She likes to see happy buyers and sellers at the closing table. Michele is a Buyer Specialists for the Weber Home Team. Her ability to communicate and negotiate has lead her to a successful Real Estate career. Her passion is to stay on top of the Real Estate trends, find homes for buyers and negotiate a deal that works for everyone. She loves working with new buyers as well as seasoned buyers and will guide them through the buying process and answer any questions they may have. Michele is always seeking extended education classes to insure he has the upper-hand in servicing his clients. Jenny is an individual with great drive and work-ethics. She is good both at working with people and with data. She has demonstrated to be an effective, well-prepared, thoughtful, and thorough team member. Her experience in customer service and the finance world is substantial. Jenny is a professional ready to face the challenges of the market and help buyers achieve their goals.